20.000 leagues under the sea . With the support of the Institut Français - Ambassade de France au Chili. At 8:45PM // Free entrance. Night of guitars 5 ! Every participations are voluntary and welcome ! From 8:30PM till 11:00PM // Free entrance. 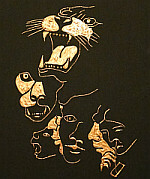 Presentation night of Claudio Rivera-Seguel artistic work. At 7:00PM // Free entrance. 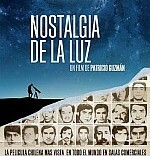 Movie cycle : Patricio Guzmán. 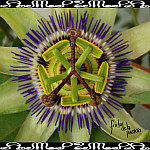 Projections realised with the pleasant autorization of Mr. Patricio Guzman. At 9:30PM // Free entrance. Night of guitars 6 ! First part : Rodrigo Peña. ¡ Concert tribute to Victor Jara ! 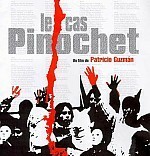 100 min, in spanish subtitled in french. At 9:00PM // Free entrance. Night of guitars 7 ! From 9PM till 10:30PM // Free entrance. 114 min, in spanish subtitled in french. At 8:30PM // Free entrance. 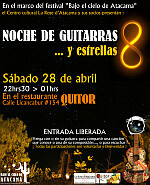 NIGHT OF GUITARS ... and stars 8 ! From 10:30PM to 01:00AM // Free entrance. 52 min, in spanish subtitled in french. At 8:00PM // Free entrance. 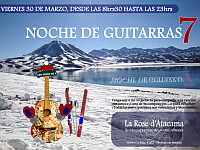 La Rose d'Atacama birthday ! Music, theatre, ceramic & Documentary projection. Night of guitars 9 ! From 8:00PM till 11:00PM // Free entrance. 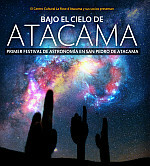 Tribute by the artists of San Pedro de Atacama. From 8:00PM // Free entrance. 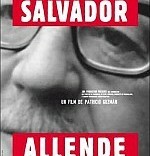 90 min, in spanish subtitled in french.